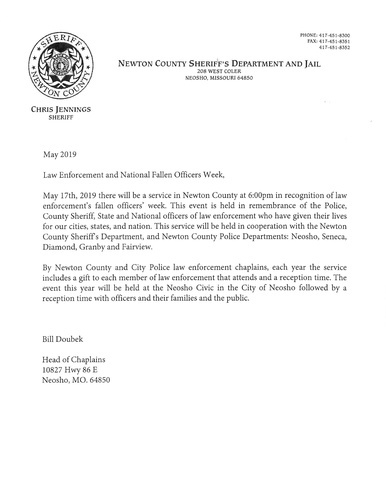 May 17th 2019 there will be a service in Newton County at 6:00pm in recognition of law enforcement's fallen officers' week. This event is held in remembrance of the Poliice, County Sheriff, State and National officers of law enforcement who have given their lives for our cities, states, and nation. This service will be held in cooperation with the Newton County Sheriff's Department, and Newton County Police Department: Neosho, Seneca, Diamond, Granby and Fairview. By Newton County and City Police law enforcement chaplains, each year the service includes a gift to each member of law enforcement that attends and a reception time. 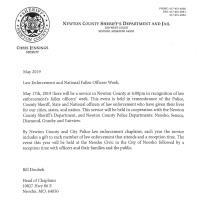 The event this year will be held at the Neosho Civic in the City of Neosho followed by a reception time with officers and their families and the public.